MBA programs don’t attract dummies, which is why you already know how important it is to get admitted to a fully-accredited school. 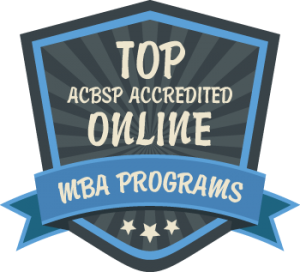 That’s why we put together this list of the top online MBA programs with accreditation from the Accreditation Council for Business Schools and Programs (ACBSP). As one of only three specialty accreditors that specifically and exclusively look into the quality and credentials of business schools and the programs they offer, the ACBSP is one accrediting organization you should take very seriously when considering the best online option for your MBA. You likely already know that most colleges or universities in the country are accredited by one of the regional or national accrediting agencies recognized by the Council for Higher Education Accreditation (CHEA) or the U.S. Department of Education (USDE). Chances are that’s something you paid attention to when selecting a legit school for your undergrad degree. But standard university-level accreditation by itself doesn’t really tell you anything about the business school specifically. The standards of business training are outside the scope of the standard accreditation process. All the special magic that goes into training future managers and executives, the accounting and financial subjects, the ethics and legal issues… it’s complicated stuff. And it takes a particular and specialized evaluator to weigh it against the expectations and standards of the larger business community. That stamp of approval is particularly important when looking at online programs. Since you can’t spend the kind of time on campus to check out the faculty and look at the resources the business school is putting into the program, you need to make sure it gets a thumbs-up from someone you can trust. And for a lot of schools, that someone will be the ACBSP. Each of them has different elements they look at when determining the quality of a program and independent standards for accreditation, whether it’s mainly strict curriculum guidelines or a focus on student outcomes. For the ACBSP, the focus is squarely on teaching and learning. The organization was founded in 1989 to address a gap in the business accreditation process. The only specialty business accreditor at the time focused primarily on accrediting research institutes. That was great, a necessary part of any advancing field, but it left a lot of qualified and dedicated teaching programs out in the cold. The council doesn’t just throw schools into this process cold, though. A mentor is assigned to help them through the process and to make adjustments to meet the high standards of accreditation. An on-site visit caps off the process, with a team of accreditors prying into every aspect of a candidate program to find any gaps before ultimately making a decision. So you can see how ACBSP accreditation ensures that MBA programs meet the high standards that you should demand in a quality business education. But that’s just the start. The council accredits nearly 3,000 programs at 430 campuses worldwide. We wanted to cull the list to give you only the cream of the crop to choose from. Our biggest step was to search for programs that were genuinely, 100%, no exceptions, entirely online. Online learning is where it’s at today—flexibility, speed, and quality all coming down the wire for you to access whenever and wherever you have time to study. But a lot of programs that take on the online label aren’t really completely online… many require orientation or occasional class work on site. That’s a non-starter if you’re taking a class from halfway around the country. Since 100% online is what you’re after, 100% online is what you’ll get with our list. Every program featured here is one you can complete without leaving the house, from application to graduation. What we came up with is a list of what we feel are the absolute best ACBSP-accredited MBA programs from around the country available entirely online. You can be sure that one of them is the perfect choice for you. Strayer, founded originally in 1892 as Strayer’s Business College, has a long tradition of excellence in business education. But recently it’s become even better known for its adoption of modern online learning technologies and broad availability. With 78 locations in 15 states and Washington D.C., Strayer enrolls around 40,000 students annually. The traditional online MBA program has 15 separate concentrations to cater to almost any career field you might want to enter. The school also offers a specialized MBA in digital entrepreneurship, which gets its secret sauce from BuzzFeed founder and former CEO Jon Steinberg… someone who knows everything that youneed to know about digital media. The Jack Welch MBA in leadership and management follows a similar path, bringing in top CEOs and business leaders to offer their wisdom and expertise on proven business practices directly to students. All of these extras are incorporated into a notably flexible program that acknowledges that every student has their own best recipe for learning. The University of Phoenix is the undisputed king of the online learning space. Enrollment in 2016 was over 140,000 students, both online and at more than 90 campuses nationwide. Each of those campuses has resources available to all enrolled students, whether you are taking your MBA entirely online or through a hybrid of online and on campus courses. By allowing you to take as few as one course at a time, UP gives working professionals the option to give as much focus to a topic as they need to master it. Their support for industry-recognized certification studies integrated into concentrations such as HR and project management gives you the option to graduate with a head start on other job applicants. And a huge student body means that UP also has a huge base of alumni already out working in every industry and ready to lend a helping hand to new graduates coming up. With UP offering a well-oiled machine in every state that it operates, the school is worth a serious look to anyone considering an MBA from an accredited university. The University of Redlands focuses on teaching students the business fundamentals necessary to succeed in a dynamic, technology-driven world. Although high-tech is an integral part of the Redlands MBA curriculum, the program starts with three core courses that offer a bedrock foundation for the same essential business skills that have been driving the economy of the world throughout history. Building on those, you can opt to stick with the general business concentration or branch out into finance or marketing, two other highly in-demand specialty areas. Although the course is designed for independent professionals to take at their own pace, you’ll be able to constantly interact with fellow students throughout the program. This culminates in an interdisciplinary capstone project that will put you through rigorous simulations working out complex business problems that will foster teamwork and critical thinking skills worthy of any high-level executive position in American business. The business skills training you get at CTU is on par with the top MBA program in the country, as you can tell from the fact that they were included on the comprehensive U.S. News & World Report Best Online MBA Programs list. But even so, that’s not the top feature of the CTU MBA. What really makes the program stand out from the pack is the proprietary Intellipath software the school has implemented to host courseware for online classes. The adaptive system uses artificial intelligence techniques to learn about you at the same time you are learning the course material. It uses that information to predict what you already understand and to focus on material you genuinely need to drill down on. This custom tailoring makes the program as efficient as possible, which improves knowledge retention and understanding. The system is impressive enough to have brought home a 2014 WOW (WCET Outstanding Work) award for technological innovation, and current MBA students enjoy an even more advanced version to help them with their studies. The UB MBA program takes a unique approach to tailoring the curriculum based on the diverse background and experience of incoming MBA graduate students. You won’t find a one size fits all approach to education here. Your experience and background will be individually evaluated and weighed on their own merits when you apply. When you graduate from the program, however, you’ll be assured of having an education in economics and finance, management and marketing, and global project management that will make you as competitive and knowledgeable as any graduate of a top-tier MBA program in the country. The three available concentrations allow you to customize your training for specific career objectives and offers cutting-edge technology and strategy skills for the modern business world. With campuses in the U.S., Europe, Africa, and Asia, Webster University doesn’t just teach international business—it lives it. A program emphasis on real-world, experiential learning drives the global perspective home in a way that purely domestic universities can’t duplicate. Cross-disciplinary training in accounting, economics, operations, and strategic management rounds out the core offering. Seventeen available concentrations allow you to build on that offering and develop specialized expertise in some of the most in-demand aspects of national and international business today. If that’s not enough for you, there are also three available joint degree programs that allow you to get a dual master’s in finance, healthcare administration, or science management. A joint bachelor/MBA option can have you entirely through both graduate and undergraduate programs and out in the world with your MBA in hand in only five years. Argosy strives to turn out action-oriented managers with strong leadership skills and business acumen. The program does this by treating you as an individual—building on your existing talents, taking your academic and professional background into account then enhancing your current skills to mold you into the kind of executive that corporate America is hungry for. Critical thinking and communication skills are built on the fundamentals of accounting and economics in the standard curriculum, which you can then build upon further with one of three available concentrations for a deep dive into a specialty of your own choosing. A challenging applied capstone project then cements the curriculum by integrating those subject areas and allowing you to demonstrate your proficiency. If Brenau isn’t a name in MBA education that you’re already familiar with, that’s likely to change in the coming years as the school continues to produce high-quality MBA graduates who are being snapped up by American businesses hungry for quality candidates. You don’t rise to that level of expertise by coasting through easy courses, either. Brenau’s online programs are rigorous and compressed, a challenge you will have to rise to meet to keep up. But with classes as short as seven weeks, it also allows you to pack a lot of learning into a short period of time. Selecting one of the twelve available concentration areas will increase that challenge but also add to your expertise. With two different variants in accounting concentrations, the school is particularly focused on producing numerically literate graduates capable of unraveling even the most complex balance sheets. Northwest Nazarene is a highly respected Christian college that offers a top tier MBA program that makes a strong connection between ethical business leadership and the financial and managerial acumen that American companies look for in their executives. It is also unique in offering an MBA with a concentration in Religion, developed in partnership with the Graduate School of Theology. The applicable electives take students from business environment and financial systems training right into introductions to ministry and culture and spiritual formation. Alongside solid concentrations in accounting and healthcare, this gives graduate students a set of options they won’t find elsewhere in a business graduate program. The accounting emphasis option also offers explicit preparation for the CPA exam, a vital part of the path to an advanced career in accounting. The AIU MBA program offers expertise with a heavy foot on the accelerator. Designed for busy professionals who know exactly what they want, the AIU MBA clears the decks to deliver as much knowledge and expertise to you as quickly as possible. Twenty-four/seven technical support means you’ll get any help you might need anytime day or night. The school’s intellipath learning management system uses smart artificial intelligence technology to figure out what topics you are already well-versed in and to touch on them only lightly, saving your valuable study time for the things you really need to cover in-depth. Finally, the Career Services Team is standing ready to get you out the door and into a job making real money as soon as you get that diploma in your hands. If you need a quick program that doesn’t compromise on excellence, AIU is just the place. The Anderson MBA program practices a philosophy of salt and light in their business education. They believe that success goes beyond pure profit and only truly emerges when it is tied to a purpose. Integrating Christian values with business teachings provides a focus on ethics and good stewardship that is absent in many other MBA programs. At the same time, the school provides instruction that ensures that competence at basic business tasks is not compromised. You’ll have the best instructors offering the most up-to-date education in basic principles of business as practiced in modern, fast-paced, high-technology companies. At St. Ambrose you’ll learn from knowledgeable faculty with real-world business experience. With a heavy proportion of doctorate-holders, you know the academics will be strong. At the same time, they never lose sight of the practical aspects of modern business. The classes are kept small so you can absorb the maximum amount of personal attention from your instructors, who ensure that you understand the material down to the last detail. Curriculum are regularly updated because St. Ambrose understands that business is a rapidly evolving field. Technology and strategy are core components of the St. Ambrose MBA program and you’ll get a full plate of data analysis classes as well as traditional education in the standards of business excellence including accounting, ethics, and financial management. The MBA program at Thomas More College is part of the school’s TAP Program for adults and professionals. It’s oriented from the start to provide the right degree of support and flexibility for professionals trying to further their careers through education while working full-time. Courses are accelerated and you have the option of switching between on campus and completely online courses, whatever provides the best fit for your current schedule. The Masters Project capstone course at the end of each program allows you to come together with other students to participate in a genuine consulting project with a regional business or non-profit organization facing a real-world problem. One recent cohort helped the Cincinnati SPCA (Society for Prevention of Cruelty to Animals) redesign its outreach program, resulting in accolades and measurable improvements to program performance. Equipped with that kind of experience, TAP graduates have a leg up on the competition when it comes time to apply for executive positions. Purdue isn’t kidding around about the global nature of their MBA program—the curriculum is set by a panel of international business experts who hand select the most up-to-date topics and trends in the business world to focus on. The program has a particular emphasis on production and distribution models, both key components of the average multinational supply chain. It doesn’t hurt that Purdue is already a big name in business education. Your instructors are top-notch and no expense has been spared in putting together an online classroom structure that delivers clear, effective communication and collaboration between students and faculty. Despite the size and prestige of the school, tuition costs are surprisingly reasonable. Almost anyone can afford the dynamic, contemporary MBA program Purdue Global offers to business students. Kettering’s online classes don’t make you settle for canned video lectures and a few 1990s-era webform quizzes. KUO courses are fully interactive, tying you together with both professors and fellow students in discussion forums built around class assignments. The seminar approach to learning pairs with the university’s experiential learning emphasis to give you the opportunity to learn through real-world examples and practices. The school doesn’t just teach the latest in modern business strategy and techniques—it also practices what it preaches, using lean principles to engineer courses with continual improvement best practices that keep them on the cutting edge of business education. One of those innovations is course scheduling that includes faster-pace six and eight week intervals, or a more relaxed eleven-week interval, presenting options to allow you to fit classes right into your existing schedule. Asynchronous delivery lets you work on course material any time day or night. It’s hard to find any MBA program anywhere in the country, regardless of method of delivery or accreditation, that offers as much complete customization as the Walden Online MBA option gives you. With ten different concentrations available off the shelf, you already have the ability to choose a curriculum that will best fit your own personal career goals. If none of those work, there’s also a self-designed concentration option that allows you to completely tailor your courses to fit. And you can take those classes either in a traditional course-based delivery model or through Walden’s innovative Tempo Learning competency-based program that allows you to set your own pace. You can quickly test through material you are already familiar with to focus your time on new information, or stretch the program out as long as it takes to fit into your schedule and until you get it right. Regardless of your choice, as a graduate you have the custom CareerBoost system on tap to help you build out your resume and make the contacts you need to get the job you deserve. The iMBA program at Delta State is the online version of their already successful on campus MBA. Designed expressly to cater to professionals and managers working to expand their interpersonal, managerial, and leadership skills, the iMBA builds in flexibility from day one. The online classes are chat and discussion based, putting you in touch with other students with similar goals but a diverse range of experiences. The school also works hard to offer you opportunities to build your professional network. You also have the opportunity, although not the obligation, to participate in hands-on learning with area businesses to get a real world view from the trenches. All this comes at a remarkably low cost per credit, making Delta a smart choice for students anywhere in the country looking for an exceptional value. NMSU’s online MBA program gives you the tools you need to advance your career in management with adaptable decision-making and problem-solving skills. With an exceptionally strong core program in accounting and financial management, including a dedicated course in macroeconomics, you get a solid base to build on with your choice of three different specialty concentration areas. While the General Management concentration simply builds even more firmly on the basic business skills you start out with from the core courses, you also have the option of choosing one of two other great options, HR or Marketing. While you will find other MBA programs with broader concentration selections, NMSU has dug in to develop deep expertise in these particular areas to offer a stronger and more focused specialty education from instructors who have professional credentials and experience in just those fields. If you wish you heard of Chadron State College sooner, you’re not alone. Newsweek Magazine called the school a hidden treasure of the American educational system, citing the high level of individual attention students here receive. The college has been around since 1911, quietly preparing generations of Nebraskans with the solid, practical education to make their way in the world. Today, through the magic of the Internet, just about anyone can take advantage of the terrific MBA program at Chadron. The school takes pride in its accessibility, and the low tuition rate is the best expression of that core value. You can look forward to getting a well-rounded education here that covers the fundamental elements of business that will serve you no matter what industry or field you choose to enter after graduation. With an eye-popping 27 different concentrations available, you know that SNHU has got to be the place to go if you’re looking for an MBA with a focus beyond the conventional areas. There are even two different healthcare-focused options! The specialized courses that go into each concentration are taught by expert instructors who often have recent industry experience under their belt. You can be sure you are getting real-world information and insights from skilled professionals with this MBA. An exceptional range of online services and technical support means that you never have to worry about being disconnected from either your instructors or the college community at large. And SNHU offers you the flexibility you need to fit your program into any sort of personal or professional commitments you need to fulfill outside of school. It’s a clear choice for quality education on your own terms. With a solid range of concentration focus options, affordable tuition rates, and a flexible start time you can select from among six different terms each year, TESU is worth a look no matter where you are located. Specifically designed to meet the needs of working, career-focused individuals, the program has a limited number of live online classes at set times… for most courses, you can complete your coursework and view materials whenever is most convenient. TESU combines extreme flexibility with high-quality education that won’t let you down when interviewing time comes around. By the time you graduate, you’ll have advanced communications, analytical, and leadership skills under your belt that are sure to impress potential employers in any field. ENMU’s MBA program is designed to produce top flight business experts. To that end, it hits the core components of business administration hard: rigorous classes in accounting, HR, and strategic management give you the basis in fundamentals you need to succeed in any business in any industry. But despite that focus on handing you the tools for general executive work, the school also has a great selection of specialized concentrations to choose from if you need to dive deep in a particular field. At an affordable tuition rate that got the notice of USA Today, you get the whole package for a remarkable value. The MBA program at Utica is administered by the School of Business and Justice Studies. If that didn’t clue you in that the school has a very strong emphasis on cybersecurity training and applications, then you probably picked up on it from the fact that there are three different specialized concentrations that focus specifically on business and policy security issues. And if you didn’t get it even with all those clues, well, you probably shouldn’t be looking for a job in cyberinvestigations anyway! But if you are, Utica is the place to be. The online-only version of the MBA program offers a strong base of business skills and knowledge that you can take to any general business position, or into positions related to any one of the 4 non-security-related concentrations also available here. And, of course, you can dive into security-related concentrations and fuse that strong business knowledge with the advanced cyber skills that the modern business world demands. With such a computer-related emphasis at the school, you know that their online course options are state-of-the-art. Synchronous, asynchronous, and on-campus course attendance are all options, giving you the ultimate flexibility in how you get through the program. The Godbold school has a relatively narrow focus, offering a total of only eight master’s degree programs plus several dual degrees. This allows for a significant degree of specific expertise, thanks to the deep-seated knowledge resting with instructors who aren’t stretched between a dozen different subject areas. The program stresses innovative problem-solving techniques and reality-based experience, an approach that is accomplished by placing students in internship, service opportunities, course projects, simulations, and direct interactions with business leaders. The school also offers an unusual dual degree option combining the MBA with a master of divinity degree for developing expertise in matters both secular and spiritual. Malone’s MBA fuses up-to-date business leadership, accounting, and analysis skills with Christian ethics and values to turn out future executives that are as morally upright as they are effective. Incorporating stewardship and integrity into a set of courses that delve into economic studies and principles of management builds leaders with spine and the skills needed to lead complex modern businesses to success. Malone takes a nonlinear approach to the MBA curriculum, built around collaboration, abstract reasoning, and systems thinking. Taught by a faculty of committed and respected academicians, these flexible tools of critical thinking will serve you well throughout your business career. The faculty and staff at Cameron pride themselves on providing a unique level of support to MBA students. The program is available in three different formats, which can be mixed and matched to meet your ideal attendance pattern. You have up to six years to complete the degree, allowing you to stretch out your classes to match the flexibility you need in your life or career. Combine all that assistance and support with a great array of high-level instruction in matters from accounting to statistics to management information systems, and what it adds up to is a great value from one of the most affordable MBA programs in the country. Gorgeous Ashland will make you think twice about choosing an online program instead of getting your MBA on campus, but if you can resist the picturesque home of the annual Oregon Shakespeare Festival you’ll find a top-notch online MBA program awaits you as well. As a major partner in the economic and cultural environment of southern Oregon, SOU has plenty of real-world connections to provide the grist for capstone and other projects that give MBA students serious practical skills in management. Critical thinking and career preparation are heavily emphasized here. You’ll develop the organizational and leadership skills in the SOU program to make you a quality candidate that any company will be glad to bring on board. DSU has a strong emphasis on technology education, an approach that carries over into its online MBA offering. The program is known for infusing technological innovation into both the curriculum itself and into the systems used for delivering instruction. You won’t find any faculty at DSU screwing up their homework assignment data entry or forgetting to switch on their microphones—they are plugged in and switched on. So is the coursework. A unique blend of business administration, project management, and information systems prepares each and every graduate student for the tech-heavy reality of the modern business environment. With every accommodation made to deliver course content to accommodate each student’s learning style, DSU is a clear choice for working professionals who need a career reboot. FHU’s College of Business is so confident in the ability of professors to build professional, reliable future business executives that they put their money where their mouth is: each year, junior and senior students are selected from the currently enrolled student body to actively manage the school’s one million dollar investment fund. That’s because the administration here knows that students at FHU all get a top-of-the-line education in micro- and macro-economics, finance, accounting, and managerial strategies. But it’s not just finance that powers the program at FHU. An equally expert healthcare administration MBA is also on tap for students interested in pursuing an executive career in healthcare. With a five-year dual BBA/MBA option available, you can complete your entire college career at FHU and be out in the business world in no time at all. Tarleton’s MBA degree program is designed for hardworking individuals who want to learn the advanced arts of business management and leadership through experiential learning designed to provide a window into modern corporate practices. Students here get all the hands-on experience anyone could hope for through activities like International Study Abroad Trips, and by participating in student-run organizations like the Collegiate Entrepreneurs Organization. Students here are encouraged to get their start in business even before getting a diploma! Graduates have gone on to work at major corporations like AT&T, Wells Fargo, CISCO, and IBM. Guest speakers from top industry positions offer insights and information. Liberty has long been a leader in remote education options for graduate students. The university pioneered flexible programs for working professionals by mailing out VHS tapes when that technology was still state-of-the-art. The tech has improved since then but Liberty’s commitment to making sure that remote students get the same high-quality education as residential graduate students hasn’t wavered. You’ll have the same opportunities to view special guest speakers from major companies like Adobe and you can choose from among the same 16 in-depth specializations to customize your curriculum. Liberty will give you a respected and comprehensive MBA without requiring you to compromise any current family or professional commitments. Located practically on Microsoft’s doorstep, with Amazon just across Lake Washington and other titans of technology scattered around the region, Northwest University is not lacking in faculty or students with recent tech industry experience and expertise. Their online program is a natural fit for anyone with their sights set on executive positions in the technology industry. But this program is about more than just giving students skills that will go over well in Big Tech. The NU program develops management and communication skills in all graduates that help them critically assess, decide, and operate in the complex world of modern business no matter the industry. You’re dying to know about the name, aren’t you? Founded originally as St. Clare College, the St. Francis of Assisi-affiliated school was renamed after Cardinal Samuel Stritch, Archbishop of Chicago, in 1946. Today, though, the one-time teacher’s college has become a pioneer in innovative business education. The curriculum is heavily team-oriented. Students learn to self-organize and become effective communicators through the process of completing their coursework in finance, human resources, and customer relationship management. A strong alumni network, more than 37,000 strong steeped in the same team-based support system, provide valuable connections in business after graduation.